Thank you! Btw I heard that The Pet Glider has food and treats that are good for your glider. I'm not sure which cage you are looking at. For what it is worth my cages have horizontal bars every 6 inches and they grip the vertical bars and run up and down without issue. They have other ways to climb up (ropes, chains, mesh etc.) but usually just go right up the walls when they want to get high. I'm not sure where you got that information, however, as pointed out in a post above, this is not the case. Gliders are extremely adept at climbing using vertical, horizontal, side to side or any other angle they wish. They have a very strong grip and don't slide down the bars unless that is what they want to do. You know I think this is the best place to find the information you need before purchasing your glider/s as well as any accessories. If you don't find what you are looking for in current threads, there are archived posts in every forum. Check out the Archives for Housing & Accessories for instance. There is all sorts of good information there. 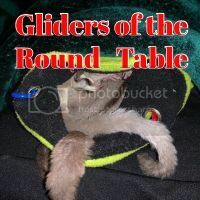 I have links to several great glider cages and also for glider safe exercise wheels on my web page to help you locate the information. As for cages - get the largest you can to begin with. I bought a cage that was too small and very quickly wanted something larger. Cage 2 was an 'economy' type cage which rattled badly when the gliders jumped and had slide up doors which made it impossible to put a glider wheel into the cage without taking it apart. That cage began to rust in a matter of months. I then invested in a large sturdy cage that cost about the same as I had paid combined for the first two cages. I am still using this cage 7 years later. Last edited by CandyOtte; 07/11/15 06:01 PM.